For the March RSO of the Month, the inSIDER recognizes our Veterans and those with a Military Connection. We salute those pursuing their education who chose to protect and defend the rights we all enjoy. We thank those individuals whose family members served or who share other military connections. In honoring our veterans, we also offer a closer look at the Veterans Resource Center which provides services and programming for veterans. Special VRC programming is planned for April 15-19. Currently, about 600 veterans from all service branches attend Minnesota State Mankato. Our veterans range from those currently serving part-time in the Minnesota Army National Guard while attending MSU as full-time students to those who have finished their time in service, have families, and are transitioning to being a civilian. The Veterans Resource Center in CSU 167 (near Student Activities), is a space specifically for veterans or anyone with a military affiliation. “We are happy to have anyone with a military affiliation come and visit. It’s a place to study, have lunch, get information, and connect with friends,” said Tim Adams, Veterans Resource Center Student Success Coordinator. The Veteran’s Resource Center helps veterans get connected with the resources necessary to complete their education whether it be helping select a major, get connected with academic advisors, and assisting with using financial benefits. “We provide a space for veterans to feel welcome, feel free to speak their mind, and have a place that they can come in and feel comfortable,” said Adams. Stay tuned to the Veteran’s Resource Center’s Facebook Page for further details on those events. When veterans are approaching graduation, the Veterans Resource Center is a great place to get connected with potential employers and getting on track for any career field. Students are always in search of money, after all, we have a lot of bills to pay and not a lot of time to make money. With that being said, how does a $500 scholarship sound?! At every Maverick home football game, there will be an opportunity for a lucky student to obtain a $500 scholarship given by Dr. Pepper. If you are a student and would like the chance to win, then stop by the Hot 96.7 van before the game or at the Student’s Rewards booth before the end of the first quarter. You must have a current MSU student ID! At halftime, the lucky student will be drawn, and they have 96.7 seconds to get to the midfield and claim their reward. Sept. 29 (Homecoming) at 2 p.m.
Oct. 13 at 1 p.m.
Nov. 3 at 12 p.m.
Nov. 10 at 12 p.m.
Every Wednesday in the CSU, Athletics does tabling, so make sure to stop by and see Stomper as well as some of the student-athletes. Later in the year, students will be able to pick up their Hockey Fast Passes on Wednesday’s in CSU123. Watch for more info! Outside the classroom, perhaps the toughest quizzes students face are questions surrounding college finances. 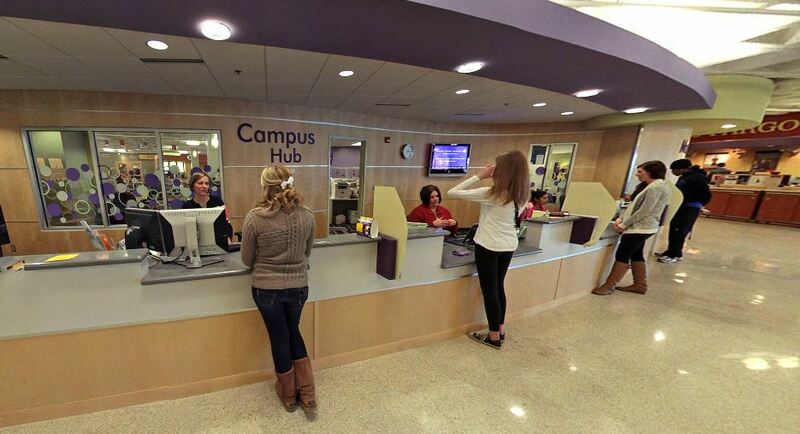 That is where that long, newly-remodeled counter on the main level of the Centennial Student Union – home of the Campus Hub – plays a vital role in a student’s successful college experience. Short lines, prompt phone calls and good customer service are some of the things students hope for on their side of the counter. But what is it like for the seven financial aid specialists when the tables are turned? Bunde said her staff seeks to provide day-to-day professional assistance to make student lives a little bit easier. She also touched on things that students can do, prior to asking questions, to get the most out of their visit. “One of the most important things students should be aware of is timelines and deadlines. If deadlines are missed, we can’t do anything to help the situation.” Bunde said. Bunde stressed the importance of thoroughly reading emails and letters sent to students about their financial aid. Answers to questions students often have can be found by reading all of the information in front of them. Bunde noted that the financial aid process has come a long way in last ten years. The Hub constantly analyzes problems that students face to provide quick and thorough responses. “It is a cleaner, easier-to-follow process today,” she said. Much of that involves intense training to prepare Hub specialists to give students the best help possible. Staff complete weeks of preparation and real-life scenarios before working with students. Bunde said that training includes working with Dr. Kari Much, staff psychologist at the Counseling Center, to understand student behavior when tackling their financial uncertainties. “It is important for us to know the difference between a frustrated student and an angry student so we can better understand where they are coming from when asking their questions.” Bunde said. Bunde suggested that students visit the Campus Hub Website. From Hub TV to the “Did you know box” – where students and families can apply for loans and grants, there is a lot of information provided to keep students up-to-date on announcements, financial information and deadlines. Maverick One Stop, the university’s online help site, is another help site when questions are not urgent. Requests for information are redirected to the Hub where a specialist who provide quick replies via email.